Senator Birmingham said that through Austrade's resources team, the government was ramping up efforts to attract overseas investment in the sector and highlight Australia's comparative advantages. That work is understood to be close to yielding results, with a significant investment by an overseas player in the sector expected to be announced before Christmas. The report, to be released on Tuesday, found that local lithium producers are beginning to move into new areas of the supply chain, while feasibility studies are under way for local battery production, including a 15-gigawatt-hour "Gigafactory" in Townsville. The behind-the-scenes moves come even as Albemarle has publicly brushed off worries from analysts and investors about rising regulatory pressure in Chile, home to the worldÃ¢â‚¬â„¢s largest reserves of lithium, a crucial ingredient in electric car batteries and mobile phones. Ellen Lenny-Pessagno, who became AlbemarleÃ¢â‚¬â„¢s Chile country manager in October, met with the Chilean Nuclear Energy Commission (CCHEN) on Nov. 23 to discuss the rejection, according to filings with ChileÃ¢â‚¬â„¢s lobbyist transparency website that have been previously unreported. The nuclear agency, which oversees lithium sales and export from Chile, had rejected AlbemarleÃ¢â‚¬â„¢s request in September to increase its quota to sell lithium. That effectively stunted the long-term expansion plans of the worldÃ¢â‚¬â„¢s top producer of the ultralight metal.. Here's a bit of history and info. project management offices in Belgrade and at the site. million tonnes of Li2O and 21 million tonnes of B2O3, giving the potential for a multi decade mine life. side of the cost curve. glazes and agricultural micro nutrients. orebody and favourable location, our planning will seek to allow for future expansion. Yeah the big miners do often arrive at the party just as the beer runs out. Interesting that Rio is getting back into borate mining, if only by accident. They had a significant borate / borax operation in Argentina but considered the borax market to be in a long-term downturn so they sold it off to Orocobre (which is mainly a lithium producer from brine). To date it has not been a good buy for Orocobre so Rio got that one right. Speaking of Orocobre, they recently finally announced that a final investment decision had been made for the stage 2 expansion of their Olaroz lithium brine operation (they hold about 66% in a jv). They intend to produce about 25,000 tonnes a year at the expansion plant. This Jadar deposit has been on the cards for a while. Rio must either be confident of lithium market, or unknowingly ringing the bell at the top? "It is not good for us, as the state, to speculate about private investments (by Rio Tinto) Ã¢â‚¬Â¦ but one could expect total investments of up to $1 billion," Antic said. The production of lithium from jadarite, expected to start in 2023, would amount to 10 percent of the global consumption of the metal crucial for the production of batteries, Antic said. Spot prices for lithium could be pushed down in the early 2020s despite increasing demand from electric vehicle (EV) batteries makers, a new report from MoodyÃ¢â‚¬â„¢s Investor Services warns. The analysts came to this conclusion after carrying out a mine-by-mine analysis projecting lithium supply build-up to 2025 based on company statements, including potential risks. Effects of spot price weakness resulting from oversupply are expected to be minimal for major lithium producers, such as Albemarle and FMC (Livent), as those companies rely mainly on long-term contracts with minimum prices and other protective terms that mitigate low spot prices and protect margins. Moody's also predicts a major structural shift in the industry over the next decade. The sector, the report says, will move from a few majors producing battery grade lithium from low cost brine in Chile and Argentina, as well as low cost ore from the Greenbushes rock mine in Australia, to a more diverse industry with new rock-based entrants mining ore in Australia and selling spodumene to Chinese converters, as well as new rock and brine-based suppliers in Brazil, Canada and the US. The analysts, however, did not consider unexpected difficulties to either expand production or kick-start new lithium projects, such as issues faced recently by ChileÃ¢â‚¬â„¢s Soc. Quimica y Minera de Chile (SQM). In August, SQM Chief Executive Officer Patricio de Solminihac was expecting prices for the second half of the year to be lower than in the first six months. But last week, the worldÃ¢â‚¬â„¢s second-largest lithium producer changed its mind. It now expects lithium prices to remain firm in the fourth quarter at about similar levels to earlier this year because of strong demand and supply issues. The forecast came as the company reported third-quarter revenue and net income that missed analystsÃ¢â‚¬â„¢ estimates due to unforeseen hitches in ramping up an expansion project, which hit sales volumes. MoodyÃ¢â‚¬â„¢s also warns about the supply of other commodities supply could affect lithium prices: "Nickel and copper availability is likely to constrain the ability to produce electric batteries. This will dampen lithium demand growth until ample nickel and copper is available Ã¢â‚¬â€ which may take a while," the report concludes. Lithium-ion prices are jolting upwards, itÃ¢â‚¬â„¢s time to take a second generation storage solution seriously. Craig Irwin of ROTH Capital Partners says his company has been a long-term skeptic on both the lithium-ion battery cost curves shared by major OEMs and price forecasts presented by industry consultants. Twenty years on Wall Street, almost entirely in CleanTech, has taught me how during periods of market enthusiasm, estimates will be pro-cyclical, tracking largely with sentiment. Positive sentiment for lithium storage is undeniable, and we too are bullish (small Ã¢â‚¬Å“bÃ¢â‚¬Â). Where things break down, is when discussion of market pricing and volumes separates from reality. We canÃ¢â‚¬â„¢t fault OEMs for wanting to share a competitive outlook when a neighbor suggests an overly optimistic view on how prices are heading lower, but only a few iterations can start a much wider game of liarÃ¢â‚¬â„¢s poker. We closely follow the Japanese Ministry of Trade and Industry (METI) for quality data on lithium battery cell volume and price trends (see graph below). METI data often diverges widely from pricing estimates shown by analysts and consultants. This data shows consumer lithium battery pricing as sometimes volatile, yet mostly flat for the past three years, after the prior five years of moderate cost reductions. 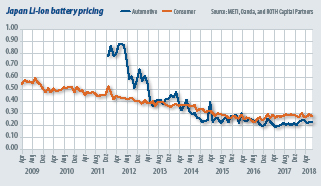 Looking at METIÃ¢â‚¬â„¢s data series for automotive also shows some impressive medium-term price improvement, as expected, but more recently prices seem to be increasing. This differs greatly from the conventional wisdom where many believe costs are dropping by over 20% a year and expect significant cost reductions to continue to the horizon. Neither Tianqi or Albemarle report output and sales from Greenbushes. Based on cargo volumes from Bunbury, however, Talison shipped to China 72,352wmt of concentrate in July, 67,276wmt in August, and 35,329wmt in September, totalling 174,930wmt. Talison also shipped 9,003wmt to the USA and Europe representing technical-grade sales. Exports are up slightly from 173,562wmt in Q2 2018. Talison produced 31,000t LCE in Q3, 5,000t LCE higher than product export, with the difference perhaps due to timing of shipments versus production that would be expected to show in Q4, although some production may now be being held in Australia for processing at TianqiÃ¢â‚¬â„¢s Kwinana plant. Neometals reported 111,023wmt (77,000wmt at 6.0% Li2O and 34,000wmt at 4.0% Li2O) of concentrate production in Q3 at its joint venture Mt. Marion mine, and shipped 91,313t to co-owner and off-taker Ganfeng Lithium. Construction of additional flotation concentrator circuits to upgrade all output to 6.0% Li2O is due for completion by end-2018 with full production at the higher grade from mid-2019. Neometals is progressing feasibility on its 10,000tpy lithium hydroxide Kalgoorlie Lithium Refinery Project with front-end engineering and design scheduled for completion end-2018 and an investment decision due by mid-2019. Galaxy produced 31,156dmt for Q3 and shipped 29,555dmt with an average grade of 5.65% Li2O, down from 47,901dmt, 45,761dmt and 5.83% in Q2. Recovery fell to 42% from 56% in Q2. Output and recovery fell due to lower feed grade, a delay in permits for mining of a new area, and a delay to the yield optimisation project which aims to boost recovery to 70-75%. In Argentina, Galaxy aims to enter into a binding transaction with a strategic partner for development of its Sal de Vida brine project by end-2018 with US$257M received from the sale to POSCO of the northern tenements to be utilised for this project. Evaluation work also continues at the James Bay spodumene project in Quebec. Tawana produced 28,419wmt for Q3, up 63% from Q2, and shipped 18,670dmt to off-taker Burwill Holdings. Spodumene concentrate produced and shipped has returned an average of >6.0% Li2O, <0.5% Fe2O3, and mica content of <0.5%. Tawana also recovered 374wmt of tantalum concentrate containing 16.4t of Ta2O5, which was sold to GAM under a one-off contract, and is engaging with H.C. Starck for long-term off-take. Tawana is investigating a fines recovery circuit to boost lithium recovery from 62% to 72-80%. Costs were US$660/dmt for Q3 net of tantalum by-product credits. Pilbara Minerals produced 11,814dmt spodumene concentrate for Q3 but only sold DSO during the period with 205,766wmt supplied to Atlas Iron, up from 145,974wmt in Q2. First shipment of spodumene concentrate departed Port Hedland in early October containing 8,800wmt of coarse and fine material and grading 6.26% Li2O and 0.72% Fe2O3. Pilbara also produced 7.66t of tantalum concentrate and sold 2.26t to Global Advanced Metals (GAM). Contrary to other new producers, Pilbara prioritised its fines circuit commissioning given the larger output volume available while the DMS circuit was being commissioned. Pilbara did not report recovery levels, as some volumes will be reprocessed, but is aiming to reach 75% by mid-2019. The company also recently approved the Stage 2 expansion to 800,000tpy, subject to external approvals and funding. Altura recorded spodumene concentrate production of 7,379wmt for Q3 and shipped two consignments of 5,000t to Chinese off-taker Lionergy in October. Spodumene concentrate produced and shipped has returned an average of 6.0% Li2O, 1.1% Fe2O3, and mica content of 0.8%. The company also secured an off-take with Ganfeng Lithium for minimum 218,000t through end-2018, replacing 50,000tpy previously destined for J&R Optimum Energy in China. Altura is now focussed on commissioning the fines plant to boost recovery, which is currently taking place in conjunction with production ramp-up. Mineral Resources produced 358,000wmt of DSO from Wodgina and shipped 422,000wmt as the company winds down DSO sales to stockpile ore for future upgrading to 6.0% Li2O spodumene concentrate. Construction of the 750,000dmtpy spodumene processing plant, along with the associated crushing and nonprocess infrastructure upgrades, continued during the quarter, but commissioning will be delayed by eight weeks as a result of late delivery of long lead items and congestion in the Perth fabrication and rubber lining facilities. The first-stage 250,000dmtpy module is expected to begin commissioning in Q3 FY19 followed by stages 2 and 3 in Q4 FY19.